Published on August 22, 2018 in Caribbean and General T&T. 4 Comments Tags: Earthquake. 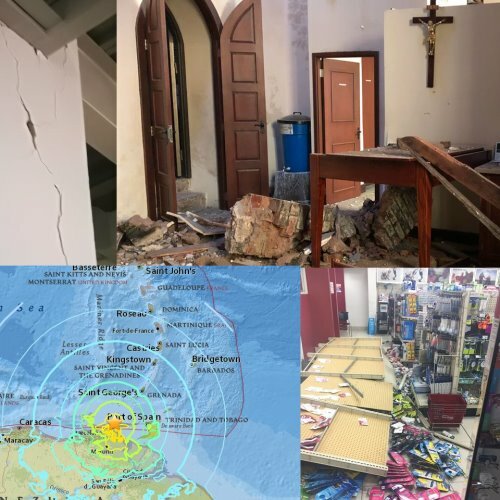 A MASSIVE earthquake, magnitude 6.8, yesterday rocked TT, sending the country’s 1.4 million citizens into a tailspin and damaging several buildings in and around Port of Spain, and other parts of the country. The earthquake, believed to be the largest ever in the country’s history, was reportedly felt in several other Caribbean islands, including Grenada, St Lucia and St Vincent and the Grenadines, as well as Guyana and neighbouring Venezuela. There were no immediate reports of fatalities in TT, but the tremor, which occurred around 5.30pm and reportedly lasted for about two minutes, during the rush hour, left many people shaken and scared for their lives and that of their loved ones. In Port of Spain, hundreds of workers rushed out of their workplaces to designated muster points, fearing the worst, as others wept, acknowledging it was the worst earthquake they had ever experienced. This was the warning yesterday from seismologist Dr Joan Latchman, following a 6.9 earthquake that rocked Trinidad and Tobago and much of the Caribbean. “While there have been 17 previous M6+ earthquakes in this region, large earthquakes are rare; this is the largest historic event within 250 (kilometres) of this location in the 20th and 21st centuries”. TERRIFIED citizens were taken to the Port of Spain general hospital yesterday in the aftermath of the earthquake which shook the country and other Caribbean islands, and were admitted for panic and asthma attacks. The most disastrous earthquake to hit Trinidad was in 1766 at 7.9 . The capital city at the time San Jose later to be renamed St. Joseph was destroyed. This earthquake was the most powerful in the country’s history. A Housing Development Corporation (HDC) team visited several areas in Mayaro yesterday where homes were severely damaged during Tuesday’s 6.9-magnitude earthquake. This is the strongest, longest and most terrifying earthquake to hit T&T in 100 years and also in my memory. For the first time I felt that it will not stop increasing in intensity for in excess of 90 seconds causing a huge commotion in the neighbourhood of Caroni as if a storm was approaching in strength to demolish the place., When will it start to decline in intensity I kept asking myself as I had never felt such sustained shaking of the house for so long. Prayers was a natural spontaneous response for divine intervention. It took me several minutes to recover from the shock and trauma that it was evoking in me. It is as if the quake had lost its way and was never going to stop playing games with me and the neighbours. This was a very rude and crude experience that seemed to last forever and I was beginning to lose hope that it will stop the shaking and the waking up of everything around and near to me. Praise God for the cessation of seismic event because He is Trini to the bone and the marrow and will not give us more than we can comfortably bear. The release of heat and energy from the earth caused the heavy and sporadic rainfall both last night and today and the earthquake was a manifestation of a cataclysmic release of energy from the crust that seem to have ended the exchange between the atmosphere and the sub-terrenean energy release valve. I am always earthquake uneasy when there is heavy rain followed by bright sun and then rain again as an indicator of a seismic event. You, Kangal, will find anything Disappointing. If the NEW Commissioner Flew over T&T WITH HIS OWN WINGS, and STOP the Earthquake. You will still find Fault. What a Negative Brain Damage person. Most of the Vagrants, pass and present walking around T&T,Was/is So call Educated Fools, gone Mad. —-Watch out.